Janome DC2014 Review - DON'T BUY Before Read! For any sewing enthusiast, be it beginner or professional, the sewing machine is like an extension of themselves. Don’t you agree? Thus, when it comes to picking out the perfect sewing machine, a lot of thought and consideration is put in the process. Why? Because a sewing machine can make or break a project! Knowing that all too well, Janome has introduced the Janome DC2014 computerized sewing machine. In fact, the machine is designed to put to rest all your concerns. 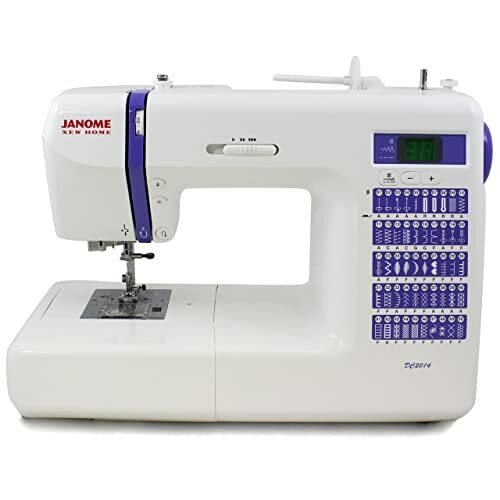 With its wide variety of stitches and user-friendly controls, the Janome DC2014 is sure to win the hearts of many. 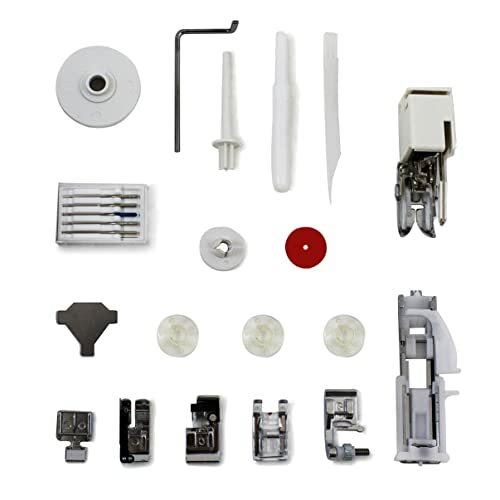 In this review, you’ll get to know about all the features of the machine. Once you make your way through it, you can decide if it is for you! Founded on October 16, 1921, Janome is a Japanese brand that produced the very first computerized sewing machine for use at home. 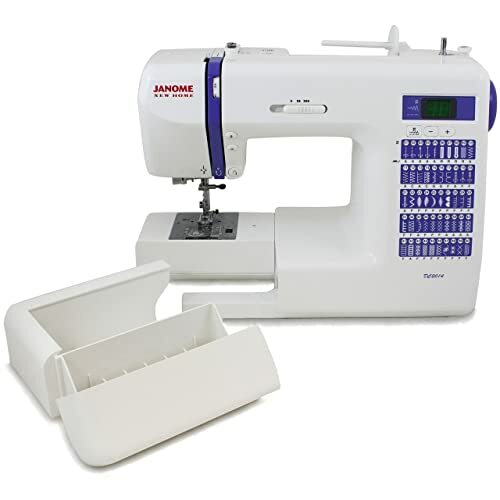 Since then, Janome has progressed and developed cutting-edge products for sewing. 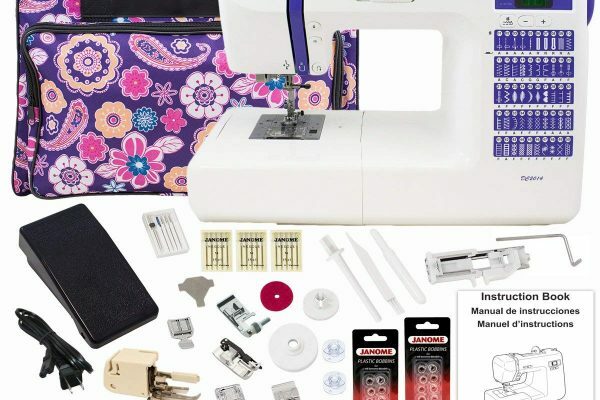 The name Janome is also often associated with embroidery, quilting, as well as serger machines. They now export their products all over the world. In fact, the company is recognized as the best provider for sewing machinery worldwide. The machine itself is quite sturdy. With a white exterior and purple accents, the design is simple and pleasing to the eye. On the right side of the machine, you will find all the different stitches. Each stitch is accompanied by a small diagram for better understanding. 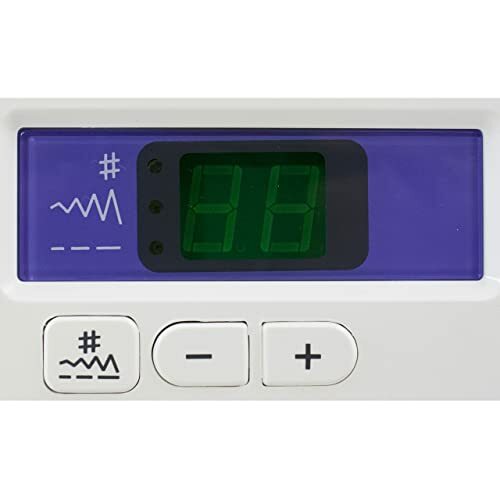 On top of the stitches, a small LCD is present that displays the numbers bright and clear. Next to the LCD, you will find a stitch selector. As a result of this feature, you can conveniently change the settings to your liking. The reason why this machine is popular amongst buyers is because of the versatility it offers. Due to its high-end functions, it enables even beginners to complete projects with minimal and effort. Thus, you are left with a professional finish without too much exertion. The DC2014 offers 50 built-in stitches to suit your needs. It is a great pick if you are starting to learn the basics. It is also ideal for you if you like to give your work a creative touch. These 50 stitches include three buttonholes that further cater to different choices and design of your project. Another feature that makes the machine easy to use is the built-in needle threader. It is fast and convenient. It even helps to save a lot of energy that may be wasted trying to thread a needle manually. However, note that this feature is only applicable for needles from size 11 to 16. All other needles will have to be threaded manually. For this part, do not forget to refer to the manual. Otherwise, you will be absolutely lost. If you follow the manual, you will find a fairly simple and quick guide to the entire process. 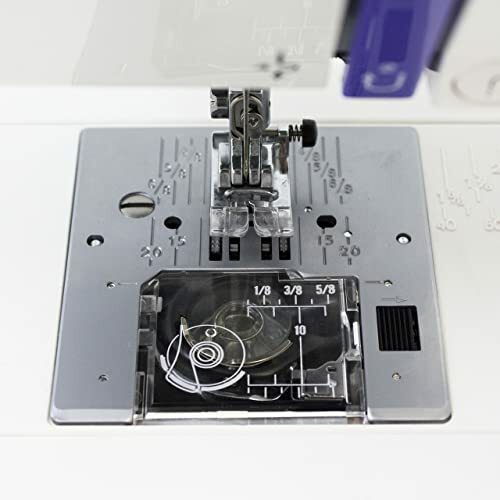 The easy drop feed-and-free arm functions are widely appreciated by those who enjoy free motion sewing and quilting. The controls are extremely simple. If you press the lever to the right, the feed dogs will lower. Similarly, if you press it to the left, they will rise again. As far as the free arm is concerned, it provides ease for sewing garments especially parts like sleeves. The speed slider can be located at the front of the machine. This option really enhances the sewing experience. Not only does it have the typical ranges, but it can also be customized to the users liking. The sizes are accessible through the LCD. Both the width and length of your stitch can be adjusted to your preference. All it takes to control the needle positions in this machine is a button. Just one push and like clockwork, the machine will respond to your command. For stitches number 1, 2, 10, and 11, the machine has an automatic system that enables it to lock and automatically stop a stitch. This feature also works just for stitches number 1, 2, 10, and 11. However, it works excellently, sewing backward with ease. Extra high presser foot lift. Now that we’ve gone over the general appearance and features of the machine, let’s talk about some good things. The machine itself is very quiet. It makes next to no noise. Its sturdy too so you do not have to worry about wear and tear. It comes with a complete manual, which is a great help. It is user-friendly. All the functions are simple, the design is neat, and all aspects are easily identifiable. It has enough features to keep a beginner exploring and a professional satisfied. The superior feed system provides one of the best stitching experiences! Comes with a 25-year warranty for all mechanical parts. Similarly, it comes with a 2-year warranty for all electrical parts. Although the DC2014 is an excellent piece of machinery, like everything else, it is not without its flaws. The very first and maybe only major con would be the price. In fact, it might even be out of range for someone on a budget. Amongst all the features present in the machine there is one feature that is absent. The automatic thread cutter is missing. This means you will have to attack your project with a thread cutter to rid it of all thread tails. All in all, the DC2014 is a very reliable and safe choice. It is, by all means, a bit of an investment, but it does not fail to deliver in terms of value for the price. Let’s be honest here; it is hard to ignore the cute design and all the built-in features! It is also easy to use hence, a sensible decision for those who are just starting out. In addition, it produces professional looking projects with minimal effort due to its high-end properties. 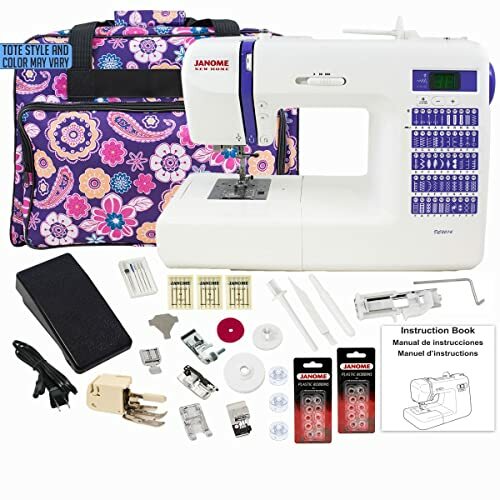 To anyone who loves to sew, this will be a very tempting option. Thus, given its shortcomings, the Janome DC2014 will definitely not disappoint.